Psychologists have shown that reference­point reasoning is a ubiquitous cognitive phenomenon intrinsic to perception, categorisation, spatial orientation, social, organisational and marketing behaviour of human beings. Various cognitive tasks involve evoking a salient entity called cognitive reference point for establishing mental contact with less salient items. It is then reasonable to assume that language use also involves a lot of reference­point reasoning. However, linguistic aspects of this phenomenon have hardly been investigated. A welcome exception is Langacker’s reference­point model dealing with grammatical constructions and metonymy. This thesis elaborates the reference­point model by applying it to lexical semantics. The only reference point that has been quite intensely studied in lexical semantics is a prototype. 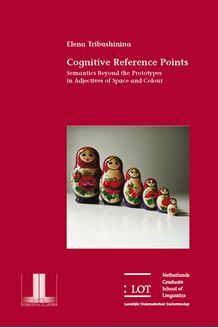 By focusing on two adjectival groups (colour and size), the author demonstrates that a whole panoply of cognitive reference points are used to anchor conceptual specifications of lexical items, prototypes being only a special case of the reference­point mechanism. An important finding is that a word may trigger more than one reference point at a time. For example, dimensional adjectives may be interpreted vis à­vis an average value, endpoints of the scale, prototypes and dimensions of the human body. Contextual variability is claimed to be related to various combinations of reference points, their relative salience and patterns of interaction. The book is of interest to scholars studying the semantics of adjectives and degree adverbs, as well as to anyone concerned with cognitive linguistics and cognitive psychology.